The build up to the Ethiopian New Year has not led to a rise in prices for popular holiday products such as eggs and poultry, sheep, goats and oxen, according to Capital's market assessment. 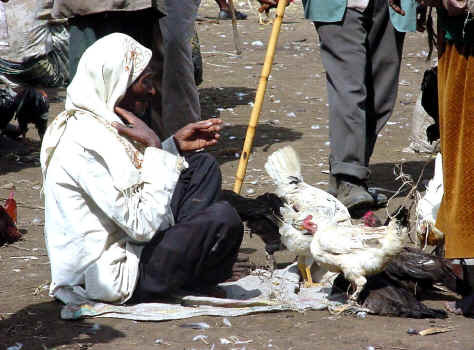 Capital learnt during the past week that the price of chickens has remained within the range of 40-80 birr on average, which is the same as a year before. The price of eggs has gone up to 1.40 birr per egg, slightly up from the one birr price a couple of ago. Meanwhile, the price of sheep ranges from 500 birr to 900 birr, while the price of a goat varies between 500 to 700 birr. Some estimates have even placed the price of healthy sheep and goats at 1,000 birr. Meanwhile, one kilo of butter, depending on quality, is being sold for 75 to 100 birr, slightly up from the past year. Doro Wot, the popular holiday meal of Ethiopia, which is prepared from chicken and eggs, is part of the New Year feast in many families. But the price of onion makes it difficult to cook the traditional food. On New Year's Eve a kilo of onion was selling for up to 12 birr, up by four birr from the same time last year. Some market players Capital talked to said this year's holiday price is mostly the same as past holidays: Gena (Christmas) and Fasika (Easter). They said that the inflation has reduced the capacity of the buyer to be active on the eve markets. "The New Year holiday is not as active as other times," they told Capital. "Meanwhile the current holiday market price is fair, I estimate that people are unable to spend money for holiday celebration because of the inflation," a trader who participated on the New Year bazaar at the Exhibition Center said. Lately, many people have been heard complaining about the cost of living and the ever increasing price of food items. From the price of a kilo of meat or onions to the price of a kilo of peas, nothing is affordable according to many consumers' accounts. In Ethiopia, holidays hold a significant place in the society. Everyone may have a small variation in the way they celebrate them, but most rituals and traditions are basically the same. Among the many holidays celebrated, many are religious. New Year, Meskal - the finding of the True Cross, Christmas, Epiphany and Easter are the major ones.